Did you ever stop to analyze the process of change… the when, the why, the how? Change is lifelong. There does not seem to be a beginning point or ending. Change is an ongoing process. If you desire to cling to your past, this booklet is not for you. 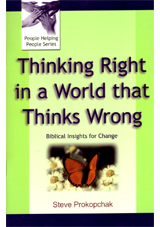 If you want to change and move on in your Christian walk, then carefully work through this booklet as it analyzes and gives applicable scriptures with helpful illustrations about this process of change.